Article 21 is a Fundamental right in Indian Constitution. Meaning of Life and Personal Liberty: - Life is not mere animal existence or survival. It would include the right to live with human dignity and all those aspects of life which go to make a man's life meaningful, complete and worth living. 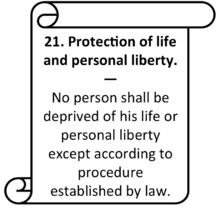 The expression personal liberty covers a wide variety of rights which go to constitute the personal liberties of a man other than those which are already included in Article 21. The courts are inclined to give the widest amplitude to the expression. On account of the liberal interpretation Article 21 has now come to be invoked almost as a residuary right, even to the extent which the founding fathers never dreamt of.